These tasty little curry deviled eggs with snap peas are a bit spicy and have a lovely ribbon of curry flavor. The tasty little peas are sweet and cut the spiciness just perfectly! Sometimes I create a deviled egg that takes my breath away. 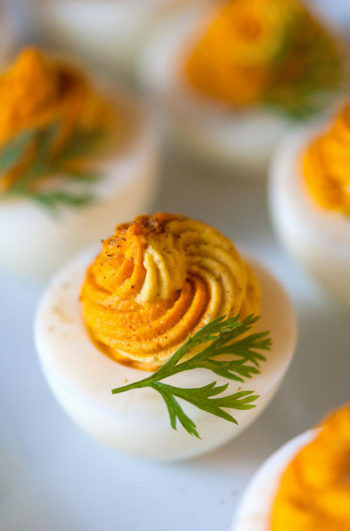 These spicy curry snap pea deviled eggs were just about the prettiest things I’ve ever seen! They were pretty enough with just the snap peas and pretty two toned color, but the flower garnish took them right over the top! It’s subtle, but you’ll notice these pretty eggs have 2 tones of yellow. It’s a very simple trick that I do if I want my eggs to look extra fancy. You’ll find the technique in my Multi-colored deviled eggs tutorial, if you want to see exactly how it’s done. I get asked a lot about flowers on deviled eggs. Which ones should we use? Should guests be told to remove them? How do you know if they’re edible? If I see a particularly pretty and tiny flower in the flower shop, I’ll google it to make sure it’s edible and not poisonous. I don’t worry too much about the flavor of flowers because I find guests instinctually pluck them off before eating them, which is fine by me. They’re just there to be pretty, after all. I also have no trouble telling guests the flowers are just for garnish. I’m mostly concerned if they’re going to be actually dangerous to eat or if they’ll actually taste bad if someone does simply pop them in their mouth. I used Spring Beauty flowers for this deviled egg which is entirely edible, but honestly, my opinion on the matter is that the flowers are just there to be beautiful, not as special ingredients. I make sure my eggs are as tasty as they are pretty, so if people want to remove the flowers, and make a little garden on the plate, I’m happy with it. Just make sure that no matter where you get your flowers, they’re well washed before you use them for garnish. These tasty little curry snap pea deviled eggs are a bit spicy and have a lovely ribbon of curry flavor. The tasty little peas are sweet and cut the spiciness just perfectly! You’ll require a pot, mesh strainer and mixing bowl for this recipe. You may also require a pastry piping bag and tip if you want to get the 2 toned effect. While your eggs boil, remove all the little peas from your snap pea pods and place in a bowl for later. Add teaspoon of curry powder and a few shakes of cheyenne pepper to one bowl, and mix. Depending on the strength of your curry’s flavor, you might have to add a little more to get a real good punch of curry flavor. You may also have to add a little more mayo if your curry makes your filling a little dry. You now have your two fillings. Lay down 2 pieces of plastic wrap on a flat surface. Spoon your fillings onto each piece, and carefully roll them up into tubes. Snip the tops with scissors. Carefully place the two fillings side by side in your pastry bag. Fill your eggs! 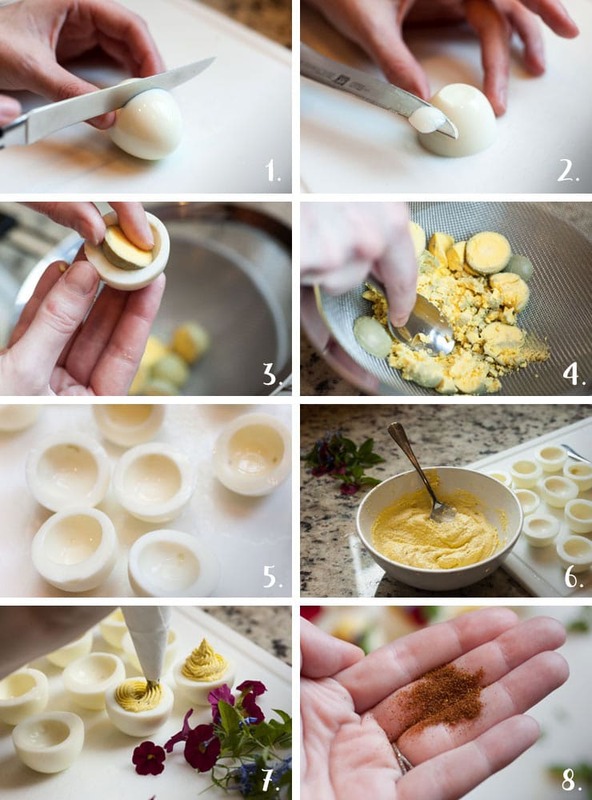 Garnish your eggs. Carefully place your tiny peas along the edge of the egg, and give each egg a sprinkle of celery salt. You can add some lovely little flowers to each egg too. They make them look like Spring!